Airplane by Plain White Ts is a terrific song to advance your fingerpicking skills. It’s not one of their most famous songs, that would be Hey There Delilah, but I’m sure you’ll love it nevertheless. Our video guitar lesson on Airplane will teach you how to play the entire song, split up into several sections. We’ll be learning the intro, which is the same as the verse, so I call it intro/verse. Pretty imaginative if I say so myself, hehe. Afterwards, we’ll learn 2 separate chorus sections, and we’ll finish with a huge ending. How huge? You’ll have to watch the lesson to find out. 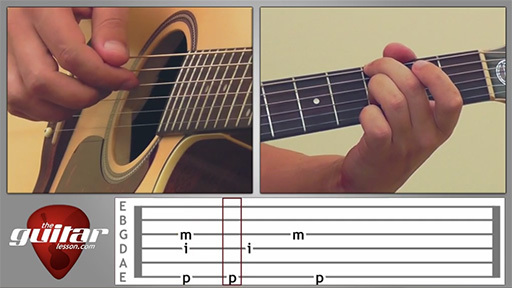 First thing’s first, we’ll start the tutorial by learning the fingerpicking pattern. It seems complicated but it’s not, you just need to get your fingers used to it and you’ll be playing it blindfolded. Keep in mind that the picking pattern I teach is good, but if you add a note here or leave one out there, it won’t be an earth shattering mistake. You’re holding down chords, and as long as you keep your rhythm going, it’ll sound good. In fact, I would encourage you to play around with the picking pattern, and see if you can come up with another one that you like. Now once you have the picking pattern for Airplane programmed into your fingers, we’ll learn the intro/verse chords. It has a really catchy melody, as does the entire song, so I’m sure you’ll enjoy it. After the intro/verse, we’ll learn to play 2 chorus sections. They are similar, but not the same. At the end of the second chorus, you’ll be doing some interesting slides, which add a really nice embellishment to the song. And of course, last but not least, we’ll learn the ending. As you'll soon see, Airplane is a great song to learn, it'll really improve your fingerpicking skills, and get you moving all over the fretboard. Make sure you download the tabs to Airplane, it'll show you the exact chord progression you'll need to use while playing the song. Airplane was released by Plain White T’s in 2010 on their album Wonders of the Younger. The song is played in the key of G minor. Sorry, but you've reached a premium content area. The download of the Airplane tablature file is only available to premium members. Sorry, the same goes for the backing track. To download the backing track to Airplane, please log in and revisit this page. I can’t play your videos on my ipad. What should i do? Hi Gaba, they should play, what happens when you press play? Are you sure you have a stable web connection? Try changing the quality of the video to normal.